Traditionally only Russian ships and aircraft were named after prominent figures, though small arms also bore their inventor’s name. But two Soviet tanks are enshrined in military history not under the customary ‘T-’ prefix but with people’s initials: the KV (Kliment Voroshilov) and the IS (Joseph Stalin). In this two-part piece we look at the heavy KV tank, blooded in the Winter War with Finland, modified to pack a punch that risked flipping it over, and thrown at Hitler’s invading forces with devastating effect in 1941. In the summer of 1941, as the Nazis implemented their Blitzkrieg strategy in the early months of World War II, using fast tank and infantry attacks to cut off and surround unwieldy Soviet formations, some extraordinary feats took place. On the second day of the war, amid the confused Soviet retreat, a single KV-2 tank blocked the supply line of the entire German Army Group ‘North’ armored division. The Wehrmacht’s 11th Tank Regiment’s diary takes up the story, describing how the bridgehead captured by the Raus battle group was cut off by the lone KV, tying up the regiment for two critical days. “In the afternoon, the reinforced company and the headquarters of the 65th Tank Battalion moved to the intersection to the north-east of Raseynyaya. Meanwhile, a Soviet heavy tank blocked the road, cutting off battle group Raus from the main forces." “Efforts to destroy the tank through the night were unsuccessful. A battery of 88 mm anti-aircraft guns was brought up, but the 88 mm was no more effective than the 105 mm howitzers. An attempt by sappers to blow up the tank with a mine also failed." The German frustration grew until an entire operation was launched against the KV on June 25. Several light Czech-made PzKpfw 35 (t) tanks were sent forward to distract the Soviet crew with a barrage of fire while the 88 mm AA guns were brought to bear. Three of a dozen 88 mm rounds that were fired penetrated the KV, while infantry mounted the tank and tried to open the hatches. As the turret suddenly began to turn the Germans threw in hand grenades until the steel beast finally fell silent. Inside the wreck the Germans found the remains of six crewmen who had halted the offensive of an entire Panzer division for 48 hours in their immobilized KV-2. The KV’s history began in early 1939, when the Leningrad Kirov Plant’s chief designer Joseph Kotin proposed developing single-turret tanks as well as multi-turreted designs like the T-35. Stalin backed the idea. As well as pushing forward work on the multi-turret SMK and T-100 tanks, the plant received orders to build a heavy single-turret model named in honor of Stalin’s Commissar of Defense, Kliment Voroshilov. Packing less firepower but with thicker armor, the tank weighed 47.5 tons, was driven by a 500-horsepower diesel engine, and was fitted with an epicyclic gearbox and individual torsion bar suspension. The Winter War between the USSR and Finland began on Nov. 30, 1939 with the Soviet invasion of its neighbor, ostensibly to create a buffer zone for Leningrad, which Stalin considered dangerously exposed. Despite outnumbering Finnish forces by around three to one, Soviet troops suffered disastrous losses and were repeatedly repelled by the Finns. After a tactical reorganization, the Soviet forces eventually pushed the defenders back in 1940, as a result of which Helsinki agreed to cede the territory the Soviet Union demanded. The war cost Finland 11 percent of its territory and 30 percent of its industry, but enhanced its political and military reputation, while for the Soviet Union the conflict was a testing ground for new hardware and hastened the introduction of much-needed military reforms. An experimental model impressed a high-ranking panel at the Moscow Region’s Kubinka test range on September 20, surmounting all obstacles with apparent ease. Driver P.I. Petrov later recorded the challenges of this display in his diary: “I overcame the obstacles with some difficulty in the KV. The engine worked falteringly, and when I crossed the river, water flooded the fighting compartment. Fortunately the engine did not stall and I was able to bring us to the opposite bank. After a few adjustments the KV was sent to its baptism of fire in the war with Finland. On Dec. 17, 1939, a tank crewed by factory testers had its first engagement near Lake Summayarvi. On the return journey the KV gave a tow to a damaged T-28 tank. After the battle the crew found that the gun barrel had been holed right through. After the engagement the crew counted 43 strikes from armor-piercing shells on the tank's turret and hull. A caterpillar roller also took a hit but the KV did its work and kept the crew alive. On Dec. 19, 1939, likely after the battle report of the incident was seen in Moscow, the KV was formally adopted into service and put into mass production. In view of the combat experience gained against the Finns, the KV underwent some final adjustments. The underside of the hull was thickened, ground clearance reduced and some design elements simplified for mass production. The crew was cut to five, a bow machine-gun was fitted and work commenced on a new main gun. The 76.2 mm L-11 cannon was deemed underpowered and unreliable and the F-32 cannon was ordered instead. On July 7, 1940, the Kirov plant in Leningrad received orders to produce 130 F-32s by the year’s end for the KV. But the experience of the Winter War also prompted a rethink and a gamble with the main armament. Soviet Marshal Timoshenko proposed fitting the KV with a 152 mm M-10 howitzer to knock out pillboxes and bunkers that had slowed the advancing Soviet forces. 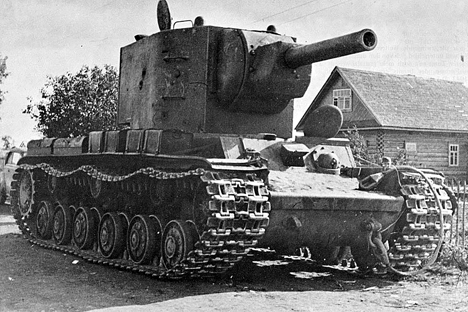 Now weighing in at 52 tons, the newly armed tank was named the KV-2. Its massive, ungainly looking turret could theoretically fire 40-kg and 51-kg concrete-piercing shells – but no one knew if the main frame would withstand such a huge recoil. But the KV coped admirably with the new demands and duly went into mass production, adding considerable muscle to the Soviet war machine in its critical hour.